Looking for an extra night on route and an extra 1 or 2 days skiing. 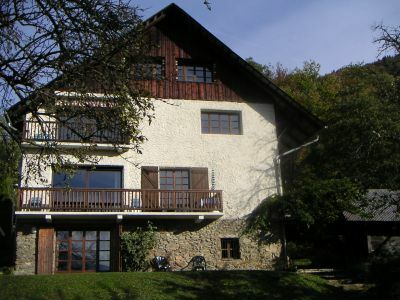 Chalet Verger is a stunning house near Albertville, run by a British couple who are happy to take bookings for one night. Ski all day Saturday, stay the night and leave on Sunday or Arrive there on Friday and be up in the resort by 9 am to ski all day. A quaint central 2 star hotel offering comfortable hotel accommodation in Meribel Les Allues. If you need an extra night at either the beginning or end of your stay, this is worth considering. If you are looking for luxury chalet accommodation in Meribel centre, then please try our friends at Delicious Mountain. Delicious Mountain are a local, independent businessoffering two of the finest luxury chalets Meribel has to offer. Fancy a stay in the Haute Savoie? - Check out our friends at Mountain and Tradition for Les Gets Apartments and Chalets. An impartial and informative resource to help you travel to, from and around Heathrow Airport. An impartial and informative resource to help you travel to, from and around Gatwick Airport. An impartial and informative resource to help you travel to, from and around Manchester airport. The Independent Meribel website with lots of useful information on all aspects of Meribel. Helpful and easy to get around, maps, ski schools, webcambs, shops, and lots more. The best place for ski clothing and accessories hire online. Choose and book your all inclusive ski outfit (jacket, trousers, goggles, gloves) and we deliver it for free to your accommodation place the day of your arrival in resort. For men, women, and children. Massage and Beauty treatments in the comfort of your chalet. Professional and qualified British therapists are on hand to help you get the most from your holiday, whether your after relaxation or treatment for your muscles to maximise time on the mountain.